Having your computer or laptop serviced on a regular basis can help make them perform better and prevent the risk of failures caused by overheating, resulting in data loss or corruption. The pictures of the computer to the right had data errors caused by the PC randomly shutting down or restarting after 10 - 15 minutes of operation. This was due to the cooling fan and vents being blocked by dust. It was so bad the fan could barely turn! After cleaning the fan, vents and the whole computer case, this PC ran 25°C cooler! It hasn’t overheated again as it is now on a yearly maintenance contract where the fan and vents are inspected and cleaned every year. The initial build-up of dust took only 3 years to accumulate! In certain environments, large accumulations can take only a few months! Dust build-up can consist of general household dust, cigarette smoke, fine ash particles from coal fires and more commonly log burning stoves. These all contribute to the premature degradation of the computer and laptop components. 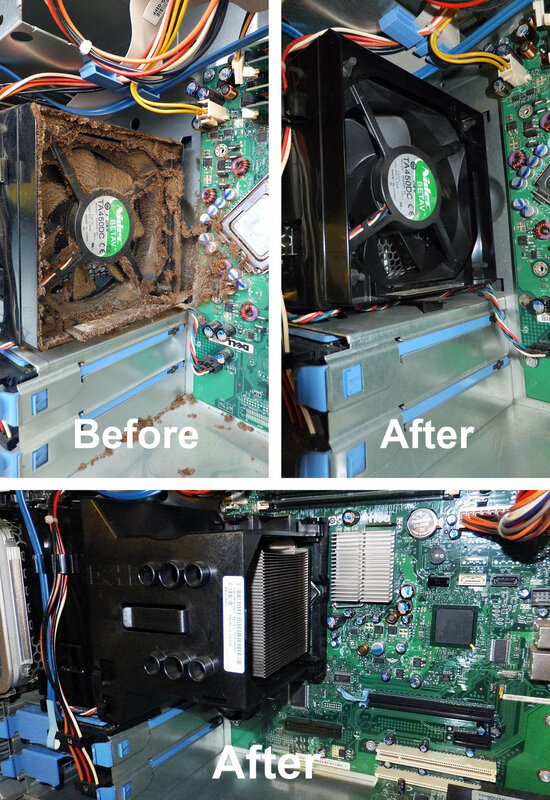 The before and after pictures below are the cooling fan assemblies from laptops we have received for servicing over the years. We generally find that customers use their laptops on the carpet, sofa, beds and on laps. Using a laptop on a bed, sofa or carpet can run the risk of the laptop overheating and in some cases catch fire! Using a laptop on your lap can cause burns to the skin. Idealy laptops should be placed on flat surfaces like a table to allow air to circulate around keeping the internal components cool. Call 01655 728220 now to book an appointment and get your laptop or PC back to running the way it used to be! © 2006-2018. Carrick Computer Repair Services. All Rights Reserved.